The viewport has been extended to the full screen, and new transparent windows maximize the workspace. A brand new quick access toolbar allows you to easily drag & drop your favorite tools and find them faster whichever module you are in. Easily adjust the parameters of the rails and obtain automatically a swept bypass shank. Various profiles section to increase design capability and variety. Use the curved and bending feature wrap your shank around the center stone setting. Report features have been completely revamped for the V9. You can customize your reports and add the calculate cost per material, add company logo to your report, name, website. Each report can be adjusted to show as many information as you require. With the use of the retopology feature you can directly set the baguette shapes you want to apply on your design. This feature can also be applied from 3Shaper basic tools and on the honeycomb designs to perfect the overall aspect of the ajour shapes. From a deformation enveloppe built automatically around your selected object, you can Sub-Divide the built mesh then, using basic 3Shaper tools, transform the mesh and adjust the distortions as desired. Enveloppe modifications bring unlimited capabilities to transform solid. Introducing materials creation in 3Design from your own information or from the presets: you can define and redefine the characteristics of a given material by assigning its density and reflexion for real time renderings. Materials information can then be retrieved for reporting. 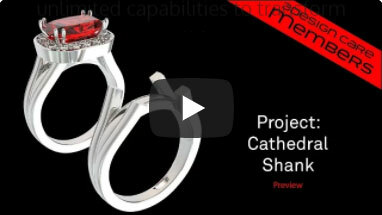 From features already in place in 3Design such as the ring size builder you can re-apply a series of other features together for further construction and customize a complete new process built-in for your own repetitive tasks. Thanks to the parametric construction this is easy. The duplication tools of 3Design bring a wide panel of possibilities with the linear duplication in colomns and rows, but also with the circular and sphereical duplication building quick and parametric copies of your items wherever you want them to be. Thanks to the parametric finger size feature, shanks can be easily associated to one unique finger parameter which later on allows users to apply unlimited modifications so the construction follows every single step made within the original design. Stones and belts are easily built with the associated tools. Adding prongs follows easily the process with the stones positions as references for the pave prongs. Offset on borders can easily be adjusted for a desired visual look. Quick creations of belts & claws which can be associated with each other to create a perfect parametric link between them and insure the creation of associative rings and pendants. Direct controls on screen from handles insure accuracy and perfect shape. The honerycomb tool allows beautiful result under gallery and inside shank ajours styles. The Ring scooping tool comes as a perfect complement to remove the material within the shank and build the inner cap. With the pave and jewelling tools then we can ajour. Loft creation and perfect organization within the construction tree allows an easy assocation of a halo base. Stone size the shape the height of the halo can be easily controled as well as linking the size finger diameter to the size of the center stone. Variable channel tool is a powerful feature allowing to build a parametric channel that will decrease and increase in size and number of stones as when the main stone changes. Associated to the claw tool you can secure the center stone to the halo. Easy creation of curves on top of the imported image. The pipe tool smoothly builds the Filigree portion which can then be easily duplicated to create the repeating parts. The filigree once achieved can then be wrapped at the matching finger size. Add your own logos and texts to your designs to achieve perfect boolean operations and obtain parametric attributes. Changing ring size will recompute the letters & logos where needed and keep same depth of cut whatever size has been applied as a change. Effective creation of ring with the ring size builder associated to the new bypass ring builder tool to shape and sweep the ring shank. Using basic 3Shaper tools available as entry level in 3Design you can shape the way the shank meets with the bridge tool. Caliper is aimed to read thickness of your objects. The software then weighs and computes the amount of material you will need to cast. Curve Analysis let you know the length of a 3 dimensional curve. Ana-lyze Physical Properties detects the po-sition of center of gravity and area of your design. Surfaces can serve as base location to fill with a texture. Independantly, zones can be filled with textures coming from different sources such as bas relief, greyscale conversion, built-in textures generator and heighfield created items inside 3Design software. Create amazing Jewels with or without computer knowledge. Come and see how efficient 3Design is! Register for a Live Demonstration.